A decade ago, this berry seemed poised to be the next big superfood. That was only for a hot second. It was quickly dethroned by acai. No doubt, acai does have some advantages, but it isn’t necessarily better. The fact that it’s a common ingredient in health-oriented foods and available in the form of acai bowls around every corner in California has more to do with availability – it’s easier to get with a reliable supply chain, because it’s cultivated in Brazil. Everyone knows that purple fruit, but few know about maqui. It might offer some unique benefits for your health. Maqui berries come from an evergreen tree native to Chile. With a diameter of only a ¼ inch (6 mm), these tiny purple berries pack a large antioxidant punch, thanks to their anthocyanins. Anthocyanins are broad category of pigments responsible for producing blues, purples, and reds in plants. The color expressed largely depends on the pH. There are several major types and the one most prevalent in maqui are delphinidin anthocyanins. Remember that form, because it appears to be responsible for some of the benefits. Concord grapes, blueberries, and blackberries also contain delphinidin anthocyanins, but the amount in maqui is exponentially higher. The plant’s scientific name is Aristotelia chilensis and it also goes by the name Chilean wineberry. The pronunciation of maqui berry is easier than it looks; ma-key. Historically and to this very day, they have been an important food in the diet of the Mapuche Indians. Native to south-central Chile, they are the only tribe of the continent who were never conquered by the invading colonists from Europe. Did this superfruit have anything to do with that? According to historical records written by Spanish conquistadors, it was observed that the Mapuche warriors had a diet low in solid food, but they drank a fermented maqui juice beverage several times daily during battle. You can read more about this in The Grand Araucanian Wars In The Kingdom of Chile. 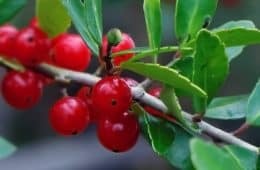 Growing a maqui berry tree in Australia or New Zealand is possible, but somewhere like the United Kingdom is a challenge. Since its native to the temperate rainforests of Chile and Argentina, it’s not frost tolerant, though it can tolerate hot and cold temperatures rather well. The growing conditions require USDA hardiness zones 8 through 12. Southern California, Florida, Texas, and Arizona can work. The Midwest cannot. To this very day, cultivation is rare. You won’t find maqui berry plants for sale. The wild growing plants in South America continue to be the de facto source for exports. The Mapuche Indians harvest them by hand when they’re in season, which is late summer. South of the equator, that’s December through March. 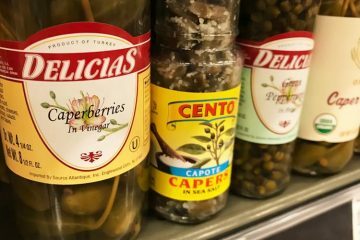 The Mapuche community is responsible for almost all commercial supplies sold throughout the world, which isn’t much since it remains a niche superfood. Unfortunately, frozen or fresh maqui berry are not for sale outside of Chile or Argentina. No one exports them. We are aware of only one seller who offers the whole dried berries and you can get them on Amazon. Everyone else sells the powder. As with acai, the flavor of maqui berry is mild. They taste similar to blackberries, with a subtle sweetness and a bit of tartness. When freeze-dried, the tartness is more obvious due to the powder being more concentrated. 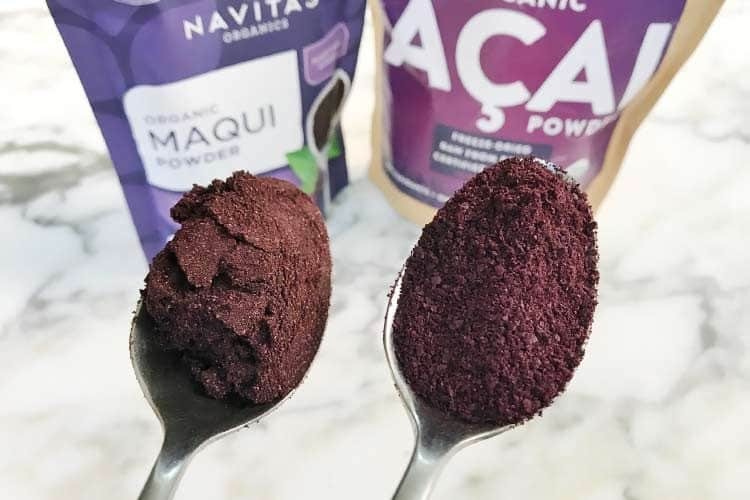 Unlike acai which is gritty and grainy, the powder of maqui has a smooth texture. It blends well into your drink, even if you only use a spoon to mix it. 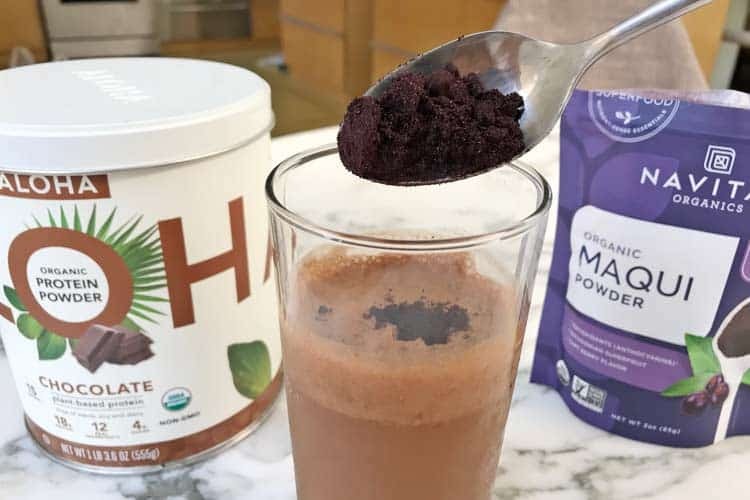 How to use it maqui berry powder is simple; add 1-2 tablespoons to your protein shake, smoothie, or even a glass of water. Stir some into your oatmeal, yogurt, or sprinkle onto cereal. It can also be incorporated into baking recipes, such as muffins, granola, and cakes. Those uses will result in antioxidant degration due to the heat of cooking. However you eat it, the taste is subtle enough that it can work with almost anything. For us personally, we enjoy the flavor much more than acai. Sure, the bowls taste amazing, but the unsweetened powder doesn’t. 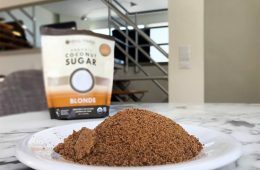 Each 2 Tbsp serving of maqui powder contains 26 calories and 1g of sugar. You also get 12% of the daily value for fiber. Those values are for Sunfood Superfoods, though other brands should be the same or very similar. It’s a guilt-free food. 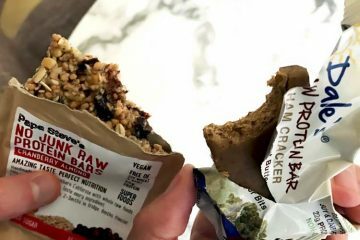 When done correctly, the process of freeze-drying does an excellent job at preserving phytonutrients. 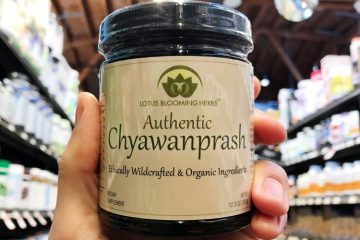 Navitas Organics reports that each serving contains a total of 114 mg of anthocyanins. While its rich in antioxidants, maqui is not a good source of vitamins and minerals. For high amounts of vitamin C, consider the camu camu fruit, which also comes from South America. According to ORAC, which is the best in vitro (lab) test for measuring antioxidant activity, fresh maqui have an ORAC value of 19,850 per 100g (3.5 oz) serving. That’s even more than black raspberries at 19,220 and elderberries at 14,697. Their antioxidant content is at least 400% higher than fresh blueberries, sea buckhtorn, goji, and strawberries. Based on an analysis of 27 different fruits grown and/or commonly eaten by South Americans in the south Andes region, the maqui is almost the highest. It’s only beaten marginally by calafate (Berberis microphylla). 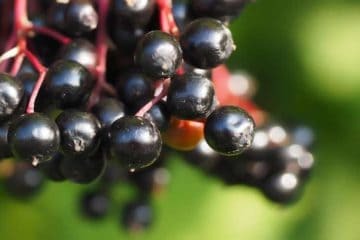 In a double-blind and placebo controlled trial conducted in Italy, 42 people were given a maqui berry supplement or a placebo to take 3x daily for 4 weeks. Before and after, blood samples were taken to measure their oxidized LDL cholesterol. Oxidized LDL is a contributor to atherosclerosis and heart disease. Scientists at the University of Chile used mice macrophages – which are a type of white blood cell – and triggered an inflammatory response in them. Next, they exposed these cultured cells to tiny amounts of fruit extracts; maqui, calafate, and Chilean blueberries. Those fruits are all native to their region. 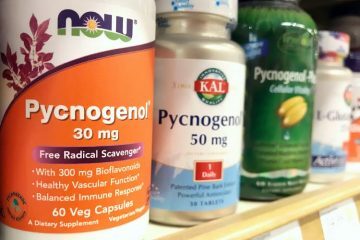 Up to 45.6% less nitric oxide was released. Only maqui was able to “completely revert the effect” of IL-10 gene expression. 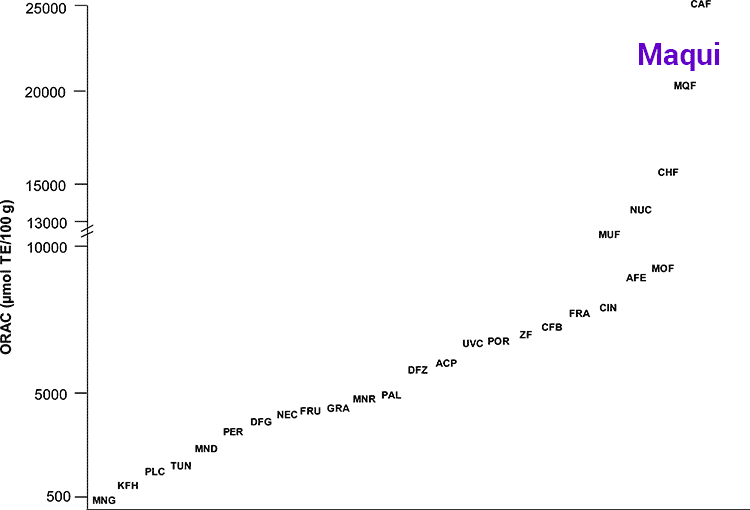 A 25.1% reduction in MCP-1 mRNA content. Many forms of pain are caused or worsened by inflammation. This enzyme is a major culprit in osteoarthritis, back pain, and other joint disorders. It also affects rheumatoid arthritis, menstrual cramps, and more. Several prescription pain medications work by being a COX-2 inhibitor, such as Celebrex and Vioxx. It has been reported that the delphinidins anthrocyanins reduce damage to photoreceptor cells caused by light stimulation and help protect cells in the eye from free radical damage. Together, these benefits may reduce chronic low-grade injury to the lacrimal glands which in turn, supports their ability to make tears. The Japanese conducted a small human pilot trial to test this benefit. 13 healthy individuals with moderate dry eyes participated. MaquiBright supplement, which is a proprietary extract, was given to them in either a 30 or 60 mg dosage, which was taken for 60 days. The participants experienced a noteworthy improvement according to the Dry Eye-related Quality of life Score (DEQS) which runs from 0 (no dryness) to 60 (extreme dryness). For the 30 mg group, the score went from 41.0 to 21.8 after 30 days and 18.9 after 60 days. For the 60 mg group, it went from 40.2 to 26.9 after 30 days and 11.1 after 60 days. To be clear… tobacco, cigarettes, and other forms of smoking lead to lung damage and cancer, regardless of what you eat or supplements you take. Still, there are recommendations in place to hopefully reduce those risks, even if reduction may be trivial. At the University of Chile in Santiago, a human study was conducted with 15 mild cigarette smokers who were otherwise healthy. They only smoked 3 packs per year on average. Delphinidin anthocyanins have been associated with a decrease in glucose (carb) absorption. This happens through the inhibition of a-glucosidase enzymes, which are the final step in the digestion of carbs. When their activity is reduced, blood sugar is slower to rise, since the carbs take longer to be absorbed. 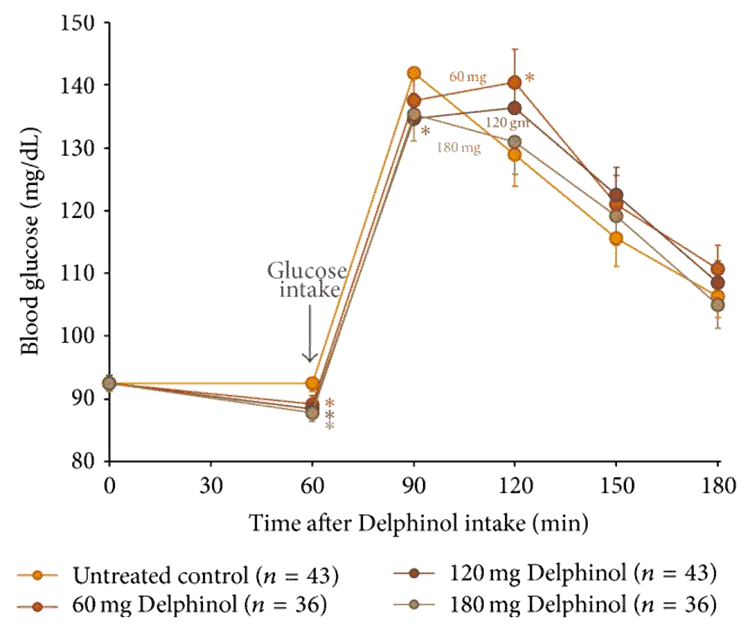 In the human study, before eating the rice, pre-diabetic participants were given a proprietary formulation called Delphinol. Those were maqui berry supplement capsules, standardized to to contain at least 25% delphinidin anthocyanins. Three dosage groups were tested; 60, 120, and 180 mg.
Lipase inhibitors are drugs used to reduce the activity of lipases found in the intestine. Lower lipase activity leads to lower absorption of fats. This is why there are prescription medications for obesity that work by being lipase inhibitors. Both are purple fruits from South America, but they have major differences. 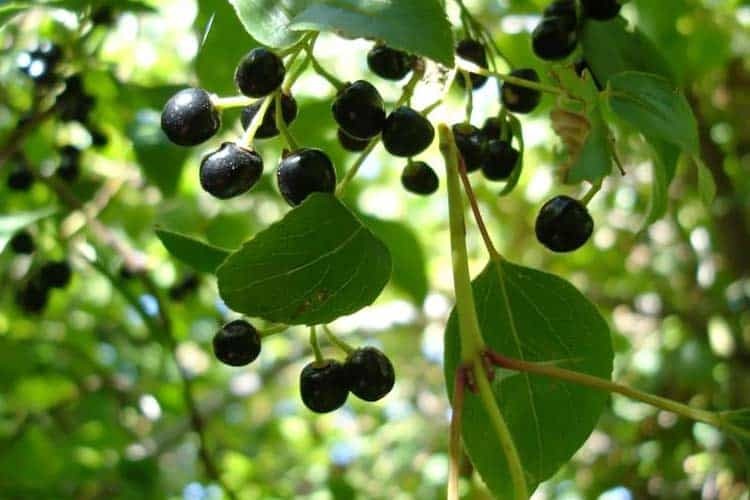 The phenolic profile of maqui berries reveal that 34% of the anthocyanins (purple pigments) are in the form of delphinidin 3-sambubioside-5-glucoside (delphinidin anthocyanins). This is important to note since the preliminary evidence for weight loss, lower blood sugar, and higher tear production are believed to be due to the delphinidin anthocyanins. When comparing freeze-dried powders of each, the ORAC value of acai powder measures at 102,700. 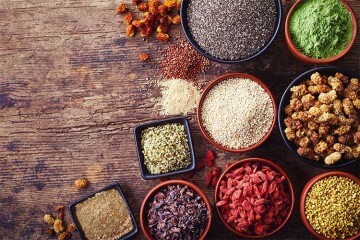 Some sources claim that maqui powder has a lower ORAC of 27,000, however there is no published scientific or medical literature reporting this number (or any other) for the freeze-dried form. ORAC is reported different ways (e.g. per gram or 100 grams). When comparing two or more foods, it’s important to re-calculate so they are being compared on an equal weights basis. We suspect an error like this may have happened, if that 27,000 is rooted in reality. Freeze-dried forms of a plant typically have ORAC values 5-10x higher than the fresh. This is due to the removal of water, which has no antioxidant activity. Given that we know for a fact that the ORAC of fresh maqui fruit has a value of 19,850, it seems unlikely that the freeze-dried would only be 36% higher (27,000). Based on the known facts, one would have to conclude that dried acai has more antioxidants, since there is a verifiable ORAC for it. 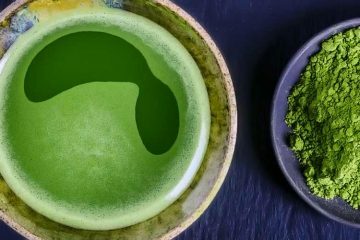 That being said, the Japanese company who created Delphinol maqui extract has published data showing the ORAC value of it being 26,762 per gram. 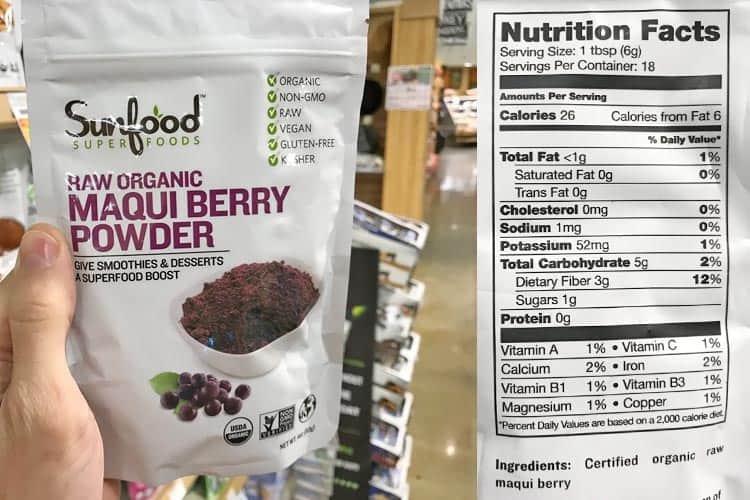 The 102,700 for acai powder cited above is per 100 grams. Acai powder is gritty, does not blend well, and does not have much taste on its own. 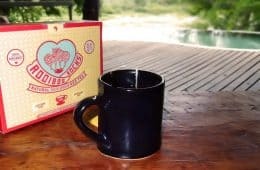 Maqui is a fine powder that blends better and has a delicious tart taste, even without sweeteners or other flavors being added. They are purple superfruits that are good for you and easy to eat, with no patterns of side effects being reported. However, acai and maqui are not interchangeable, since their phytonutrients differ. It’s important to emphasize that all medical research remains preliminary and unproven. You should only use it as a food or dietary supplement, not as a treatment for any disease. 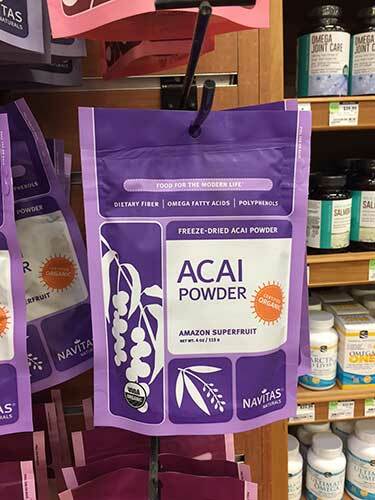 You can easily find acai powder for sale at stores like Whole Foods and even some Target and Walmart locations. Since maqui is less popular, it’s harder to find. 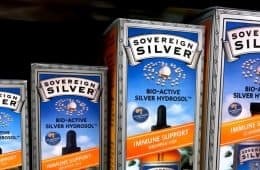 It’s not the kind of superfood you can buy in bulk at Costco. When you do find it, which brand should you buy? This is why you might not want to buy the powders from the brands you’ve never heard of. 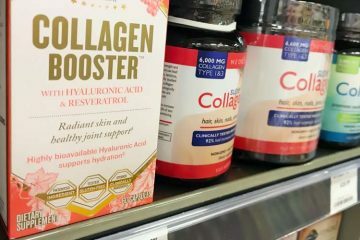 They might be better for your wallet, but worse for your body. Major brands have better resources for vetting and scrutinizing the supply chain. Expensive DNA testing and on-site visits to foreign countries are something the mom ‘n pop brands probably aren’t doing. For freeze-dried powder, try the USDA organic available on Amazon from Navitas and Sunfood. Both are well-respected companies. If you want to make our favorite shake with it, try Aloha chocolate vegan protein powder. 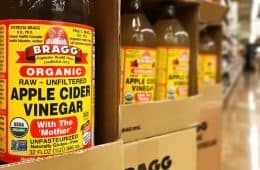 It’s unique in that it’s sweetened with monk fruit and a tiny bit of coconut sugar. 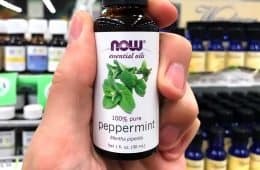 No stevia! Even with just water and a spoon, it blends amazingly! For capsule supplements, try Maquibright. That’s what was used in the dry eyes trial. It’s sold as Life Extension Tear Support. Another good brand are the vegetarian capsules by Paradise Herbs.